The Sheffield-Rotherham Advanced Manufacturing Innovation District (AMID) idea has been expanded to become an Advanced Manufacturing Corridor into Lancashire for the purposes of a Government audit of science and innovation. As part of its devolution deal, the Government offered the Sheffield city region expert advice and support to ensure they are able to put forward a proposal to undertake a Science and Innovation audit. Designed to map out local research, innovation and infrastructure strengths across the UK, the audits will help identify and build on the potential of every region across the country by making sure investment is properly targeted and uncovering opportunities for businesses to tap into. Based around the Advanced Manufacturing Park in Rotherham and surrounding Enterprise Zone, the aim is to develop Europe's largest research-led advanced manufacturing cluster - the AMID. The devolution deal documents state that the audit will: "enable an evidence based approach to deepen the understanding of the city region's science and innovation strengths and provide a new and powerful way to understand how to maximise the economic impact from the UK's research and innovation investment nationally. They will, for example, provide government with part of the evidence base on which to make decisions on catapults [A Government-funded network of world-leading centres designed to transform the UK's capability for innovation] and could be used to explore how to further the Sheffield city region's advantage in advanced manufacturing." Now Business Secretary Sajid Javid and Universities and Science Minister Jo Johnson has selected the Sheffield city region and Lancashire as one of the UK's first five audits. The Advanced Manufacturing Corridor (AM Corridor) was proposed by a consortium which represents key innovation partners in the Sheffield city region and Lancashire Local Enterprise Partnerships (LEPs) and is led by the University of Sheffield and Lancaster University. The focus will be on the globally relevant science and technology areas that underpin advanced manufacturing now within the AM Corridor and as it evolves in the future. The audit will investigate how much science and innovation is being produced, how good it is, and most importantly, how its outputs can build on existing investments and successes to drive the UK's productivity from the North. It will also look into the skills needed for companies to make the most of the opportunities afforded by the current revolution in manufacturing, which brings with it the need to upskill quickly. In addition, it will investigate how new forms of higher education can be rolled out to support the adoption of new technologies in both original equipment manufacturers and supply chain companies including new apprentice based approaches to higher education. Business Secretary Sajid Javid said: "From Sheffield [city region]'s Advanced Manufacturing Park to the Roslin Institute in Edinburgh, the UK has hot-spots of expertise that are propelling us forward in global innovation. Auditing the strengths in our regions will help us to build a long term strategy for global competitiveness and help ensure that hotspots generate more than the sum of their parts. "Science and innovation are crucial to increasing regional productivity and growth which is why we've protected the science budget in real terms until 2020, and why we are developing a National Innovation Plan." Professor Richard Jones, Pro-Vice-Chancellor for Research and Innovation at the University of Sheffield, added: "I'm delighted that we'll have an early opportunity to highlight the science and innovation strengths of the Sheffield city region. 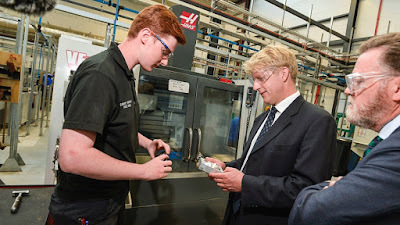 "Working with our partners in Lancashire, we'll be able to demonstrate the value of our technological assets in our universities, in research centres such as the University of Sheffield's Advanced Manufacturing Research Centre (AMRC), and in outstanding companies such as BAE Systems. "These add up to a set of resources that, when brought together, can help drive a revolution in manufacturing, driving productivity and growth in the North and throughout the whole country."